The AMAZING Skint Wallet is the perfect companion for your every journey. It's the world's lightest, most flexible, compact full-size wallet! 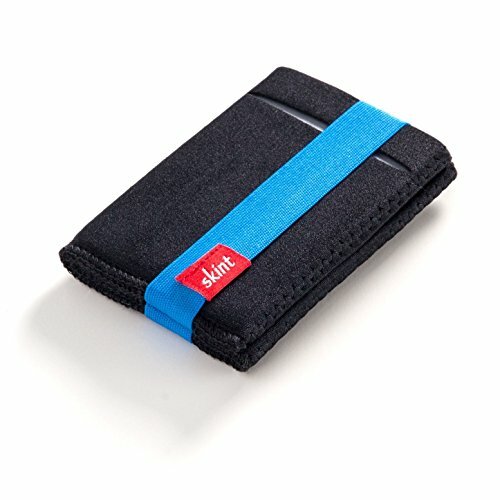 Skint is COMPACT and small enough to fit ANY POCKET while keeping all your cards and cash in one spot. Even better, you insert and remove your cash notes flat so you don't have the inconvenience of folding them into tiny, difficult to use wads. Skint is FLEXIBLE enough to handle 10 or more cards AND 10 or more cash notes with ease. Even better, unlike most compact wallets, Skint's stretchy fabric makes it easy to remove and replace your cards, so small wallet "card mash" is now a thing of the past. Skint WEIGHS NEXT TO NOTHING, unlike clunky traditional wallets. With keys and phones already occupying your pockets, putting your wallet on a diet makes a big difference. Skint is ON THE MOVE, like you. From pocket or purse to gym bag and beyond, Skint moves easily with you throughout every part of your day. Skint is the IDEAL TRAVEL COMPANION. Journey with CONFIDENCE because Skint keeps your valuables SAFE & SECURE. Skint is small enough for your safest pocket and the stretch band keeps all your cards and cash secure no matter where your adventures take you. If you have any questions about this product by Skint, contact us by completing and submitting the form below. If you are looking for a specif part number, please include it with your message.